A California-inspired home design and gift store. AREO, is inspired by the gorgeous place where we both live and work, Sunny Southern California. We feature a refined collection of hurricanes, lanterns, matches, candles, tabletop, unique cards and more, along with many exquisite handcrafted home accessories forged from recycled scrap metal and reclaimed wood. AREO promotes green and sustainable living all while showcasing the handiwork of skilled craftsman and bringing you elegant yet simple decor with a decidedly Californian touch. Come visit our store… we have proudly been part of the Laguna Beach design community since 1992 and would love to welcome you to our home at 207 Ocean Avenue, Laguna Beach CA 92651. We are open everyday (except January 1st and December 25th) from 10.00 am – 7.00 pm. Extended Summer hours (between Memorial Day and Labor Day) from 10.00 am – 8.00 pm Thursday – Saturday. 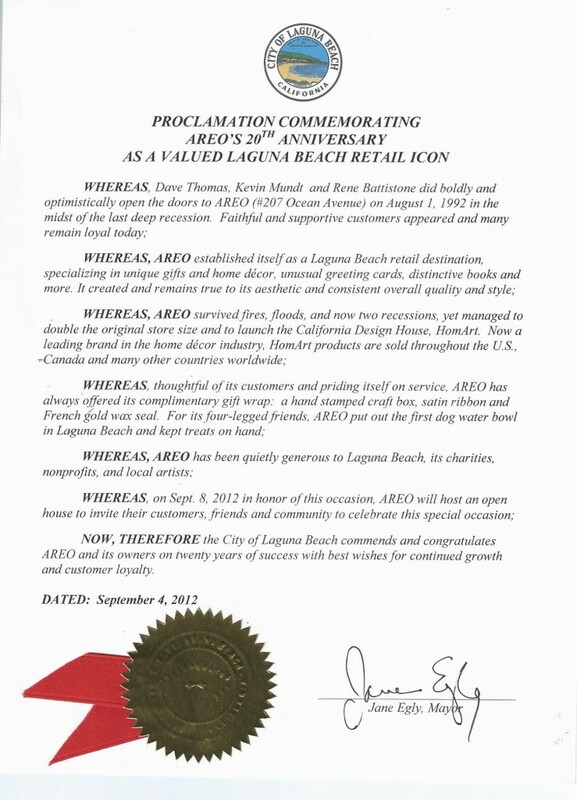 We would like to say thank you to the City of Laguna Beach for recognizing our contribution to this beautiful and thriving community.